Is this the latest version of steampunk? Shall we call it grandparent punk? 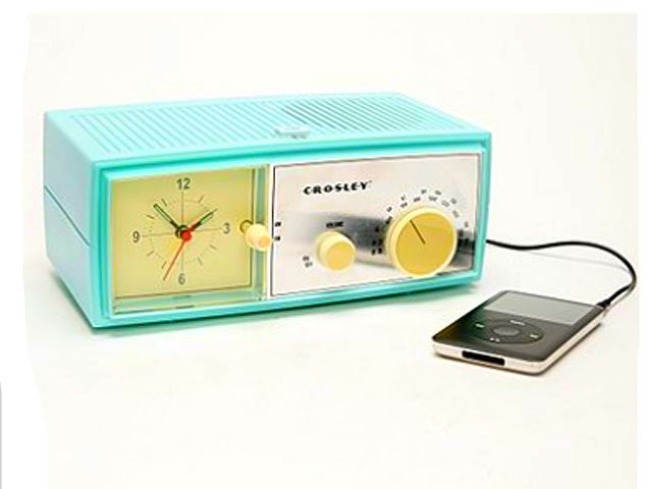 This Crosley Table Alarm Clock Speaker ($58) may be vintage-inspired, but we assure you that you can still plug your iPod into it. Made of stainless steel and plastic, the decidedly square doohickey has a nice aqua stodginess to it. Perfect for the kind of folks who wear Buddy Holly glasses. Available at Urban Outfitters (3111 M St., N.W. ; 737 7th St. NW; Tysons Corner or online). FLIGHT OF FANCY: We're desperately waiting for cooler weather (and a big deposit in Ye Olde Bank Account) to don Tory Burch's new silk Kareema Dress ($395) in a dark butterfly pattern. The simple silhouette mixes comfort with a flattering fit. Pair it with tights and chunky Mary Janes or rev it up with cowboy boots in an unexpected color. TIME FOR RECYCLING: Perfect for your inner cyclist! Eco-friendly wall clocks from Etsy seller 1byliz are made using recycled bicycle chain rings and reclaimed backing materials, from items like bike jerseys, deflated basketballs and argyle fabric. They require one AA battery, not included. Prices vary by size and material, from $38 to $45.